The 129-year-old Washington Monument is enshrouded in scaffolding this month, as workers repair the structural cracks caused by a 2011 earthquake. But the scaffolds are giving scientists the chance to carry out other work, too: Like measuring the exact height of the aging monument. Back when it opened in 1884, the Washington Monument stood exactly 555 feet, 5 and 1/8th inches. Today, scientists are trying to figure out whether it's sinking. The agency in charge of the project is the National Geodetic Survey, whose employees deal with locating and mapping America. According to NPR, along with more conventional GPS and laser scanning devices the GDS is installing a special sensor installed at the tip of the monument to complete a full survey. Here's the pyramidion itself. According to the GDS, the original inscriptions are on all four faces of the piece, "though a band of them have been obliterated by a long-standing collar which was part of an old lightning protection system." 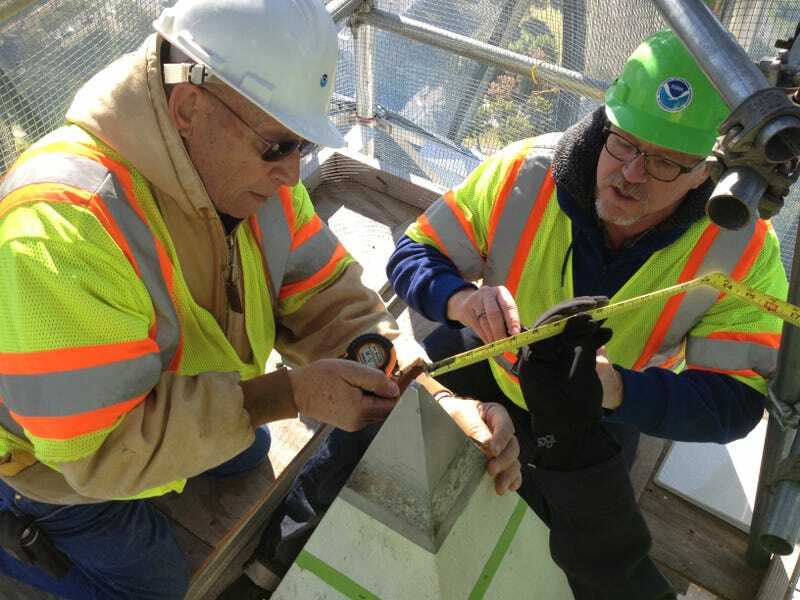 GDS crew members Steve Breidenbach, David Grosh, Courtney Lindo and Clyde Dean "discuss their initial measurements of angles and distances to the top of the Washington Monument:"
Pretty cool, right? We won't know for a while whether the Monument is actually sinking—according to NPR, GDS will need to analyze the data they collected before making an announcement—but at the very least, the project has given us an amazingly cool perspective on a piece of architecture we normally only see from afar.